Old steam & diesel trains run along the Battlefield Line of 9 miles between Shackerstone & Shenton via Market Bosworth during the season. You start off from your mooring in the Glascote marina and cruise eastwards , turning left out of the Marina along the Coventry canal. You pass through Tamworth for a couple of miles, and then you are out in the country passing the ruins of Alvecote Priory through the trees, with Pooley Field Nature reserve on your left. Polesworth is the first village of note, having stores, takeaways, fish and chip shop, off licence and pubs, etc, and spans the canal. It is 1.5 hours to here and a good place to stop for the night. Cruising through more predominantly open countryside, you will soon reach Atherstone Bottom Lock No. 11. Atherstone is a small town with plenty of pubs, for instance, Market Tavern, The Black Swan and The Kings Head. This flight of 11 locks is interspersed at first and once you are into the town the locks become closer together , but the flight is in very pleasant surroundings. To the south of bridge 41 is a useful stores. Mancetter, another small village, is to the left of the canal about .5 mile east of bridge 36. Cruise through Nuneaton and soon the Ashby canal is seen to your left, at Marston Junction, turn left here and soon the surroundings alter dramatically as you are surrounded by green fields, farms & trees, you will feel miles away from civilisation. South of bridge 16 is a greyhound stadium. The Concordia Theatre offers performances all year round. The Hinckley & District Museum has been established in a row of thatched cottages once used for framework knitting, and the museum now houses displays from prehistoric to the current period. Following on from Hinckley you pass the small villages of Wykin and Higham on the Hill and there are a couple of pubs at the latter- The Odd fellows Arms & The Fox Inn. Higham is 1 mile west of bridges 21 & 23. Running alongside the canal here are the remains of a loop railway built in the 1870's to carry coal , but it was abandoned in 1900 having never had a train run on its tracks. This is a short section with a few bridges carrying the country lanes over the canal, then you are on the outskirts of the village of Stoke Golding, which proudly boasts to be the “Birthplace of the Tudor Dynasty”. This is the site of the Battle of Bosworth where in 1485 The War of the Roses finally ended with King Richard III being defeated by Henry Tudor, who was crowned King Henry VII, the coronation being held here, in Stoke Golding. 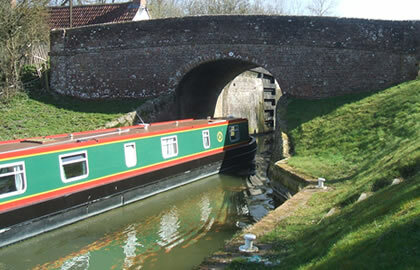 Stoke Golding itself is to the right of Bridge 25, but there are good moorings by bridges 27/28. It is a stunning village, it has an impressive Grade 1 listed Saxon church, the window sills of the Church still show grooves, which legend has it were caused by the soldiers sharpening their swords on the eve of the battle. There is a village shop where you can pick up supplies for your journey, and it's well worth having a walk around the village which is full of beautiful buildings from times past. This is also the home of the Ashby Canal Centre (marina) who have done a lot in the restoration of the northern section of the Ashby Canal. The White Swan & George & Dragon Pubs are in the village. Moor for the night it is 6 hours to here. Heading north out of Stoke Golding you pass Dadlington, another small village with an 18th century Inn- The Dog & Hedgehog , and then you find yourself in the busy Sutton Cheney Wharf. There is a trip boat here, and a café- Cafe Canalside that opens 9-5, and it is just a short walk from here to the Battlefield Visitor Centre which has interactive displays about the battle. There is also another café here and a shop. 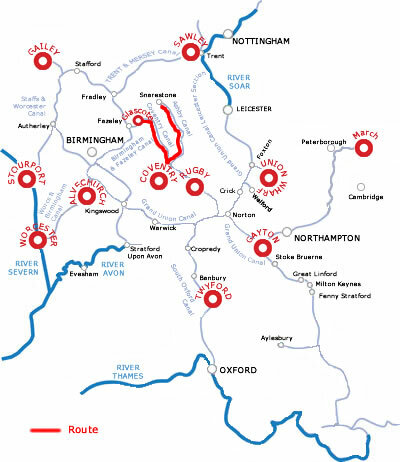 You can take a walk through the woods along the battle trails, or why not take a ride on a steam train on the Battlefield Line Railway from Shenton to Shackerstone and walk back along the towpath, around a 5 mile walk. After leaving the battlefield the canal crosses the road using the only aqueduct on the entire canal, the lovely little brick built Shenton Aqueduct. Next along the journey is Market Bosworth to your left which is a good place to stop to explore, a mile walk from the canal takes you to the town centre where there are shops, a café, and several pubs. A market is held every Wednesday. Market Bosworth is a beautiful, well preserved town with many historical buildings and some lovely places to eat, largely clustered around the old cobbled market place, a conservation area.This is the last chance to stock up on supplies till the end of the canal, so make sure to get everything you need before continuing on. The canal continues to meander through open fields passing Congerstone village, to Shackerstone which is the home of the Battlefield Line Railway. There is a tearoom at the station and a wonderful railway museum packed with exhibits and memorabilia from the days of steam. The wooded section beyond Bridge 53 marks the start of Gopsall Park. The hall here was demolished in 1951, however Gopsall Wharf by Bridge 58 was the last site used for loading coal and transporting it to the paper mills along the Grand Union Canal. The Rising Sun Pub is in the village. Snarestone is the home of the Snarestone Tunnel, which is quite short at 228 metres and is only suitable for one way traffic as there is a kink in it, there are moorings at the entrance which are convenient for visiting one of the two pubs in the village, including the Globe Pub which is in the quiet village of Snarestone. The tunnel leaves us with just a half mile cruise to the end of the canal which finishes suddenly in the middle of the countryside. It is just over 17 hours back to the Marina, so plenty of time to explore the places you didn't have time for on the way!